Futurism led to the art deco movement of the late 1920s and 1930s. This was an era of vast change. The ideals and philosophies of futurism were expanded as air travel became more widespread. In addition to fast cars and streamlined trains on the ground, shiny airplanes and sleek airships began to dominate the skies. his spurred a vision of the future that was both absurd and wonderful. This was popularized in television during the mid to late 1960s with shows such as Flash Gordon (1954) The Jetsons (1962), and Dr. Who (1963). Gold and silver metallic fashion lines soon appeared, showcasing new styles with synthetic fibers. 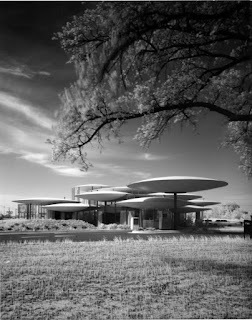 Although Oklahoma was still considered conservative by the rest of the nation, it was home to many inspired architects and designers. There are a great range of architectural styles to be found throughout Oklahoma, ranging from Colonial to Art Deco, and to those inspired by fast-paced lifestyle and optimism of the space age. Known as mid-century modern aesthetic, the space-age inspired buildings were generally constructed from the end of World War II until 1965. Many of these types of buildings can still be found in Oklahoma. This article showcases some of these amazing works of architecture, as well as the history behind them.